My name is Summer Quickle. I am fifteen years old and a freshman in high school. I am writing to you to tell you about my Superpower Dog team. Libra is my Superpower Dog. She is a Golden Retriever service dog as well as a therapy dog. We have been a service dog/handler team for two years. I trained Libra myself with hard work and dedication. I couldn’t ask for a better service dog. We attend Liberty High School together in Clarksburg, WV. She makes it possible for me to get through the school day. I began training Libra to be a service dog when she was twelve weeks old. If it weren’t for Libra, I wouldn’t have the quality of life that I have today. I have Post Traumatic Stress Disorder from something that happened to me as a child. Libra is trained in many tasks that mitigate my disability. Libra wakes me up from nightmares, grounds me during panic attacks, and leads me to exits when I’m too overwhelmed. We are also in the Junior Humane Society club at my school, and participate in various other activities in my community. 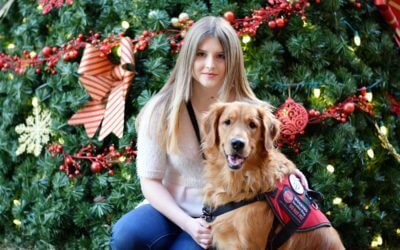 While Libra provides all of the necessary support for me as a service dog, she also gives back to others. She is a certified therapy dog through the Alliance of Therapy Dogs organization. Libra has also earned her Canine Good Citizen title through the AKC, and is currently working on earning other titles. We visit many different hospitals, nursing homes, and libraries together. Her favorite place to visit is the West Virginia Veteran’s Nursing Facility. Libra and I enjoy listening to the veterans reminisce about their stories from combat. There is one patient in particular that loves seeing Libra and sharing his stories from World War II with us. In addition to her two very important jobs, Libra is also an educator. Libra and I have visited many different elementary schools, educating the children about the importance of not disrupting a working service dog. She demonstrates various tasks and shows the children what being a service dog is all about. Libra also provides a therapy dog demonstration – which she loves. For about fifteen minutes, the children get to interact with Libra as a therapy dog. At the end of our presentation, the children understand the difference between her two important jobs, and have learned proper etiquette around service dogs. When Libra is not working, she enjoys spending time with her adopted sister, Piper, a long-haired German Shepard. Piper is in training to become a therapy dog just like her big sister. She dreams of becoming a Superpower Dog herself someday. Libra loves teaching Piper the ways of a working dog. Libra and Summer taking their victory stride at homecoming! Libra’s Superpower Dog superpowers include: her ability to be an amazing service dog, spreading happiness to others as a therapy dog, educating everyone about her two incredible jobs, and helping other dogs embrace their inner superpowers. On September 16th, 2016, after careful deliberation with six other newborn pups, Judy had a moment of pure destiny with the seventh: she knew which superpowered bundle of joy she was taking home. That puppy was Encore (or “Cori” for short). You may have already read the stories of Ricochet the SURFice canine maverick, and Rina, Ricochet’s tender, kind-spirited service dog sister. Both Superpower Dogs were partners in power to Judy, who is the founder of canine non-profit Puppy Prodigies. After hearing about Judy’s good works, a service dog organization offered Judy the opportunity to have her pick of the litter (five litters, in fact!) after Rina passed away. On September 16th, 2016, after careful deliberation with six other newborn pups, Judy had a moment of pure destiny with the seventh: she knew which superpowered bundle of joy she was taking home. That puppy was Encore (or “Cori” for short). Having lost Rina not long before, Judy was struck by the similarities between the growing Cori and her beloved Rina. Each day Cori grew, Judy saw the same affinities she saw in Rina: a love for packages, shoes, and the remote control. And Cori, like Rina, was demonstrating a loving, kind, and ingenuitive spirit. Cori has a great sense of humor, and is a playful kleptomaniac. To keep you on your toes, she steals anything and everything. She’s pretty confident, but so far isn’t crazy about swimming, so Judy doesn’t think she’ll be a surfer like her sister Ricochet. Then again, time will tell. She enjoys barking at and chasing bugs, but her endless appetite for play doesn’t stop at insects. She loves playing with other dogs, and of course, playing with Ricochet, who loves her new superpower sibling. Not a shy dog in the least, Cori wants to be in the center of anything that is happening. She’s also very curious, braving new territories without a moment’s hesitation. The ability to bring joy to others through play? Check. Robust bravery and a will to explore the unknown? Check. According to Judy, Cori has one of the biggest superpowers of them all: the power to demonstrate the continual presence of love in the world, even after loss. After losing Rina, Judy wasn’t sure if she wanted another dog besides Ricochet for a while. But Cori changed that. With the love that Cori gives to Judy and everyone else around her, she reaffirms the continuous power of love, tenderly renewing hope where it can sometimes be lost. Cori has already exercised her power on military vets with PTSD, bringing comfort and healing with the playfulness and grace of her confident spirit. Judy doesn’t yet know what role in therapy Cori will be playing in the long term, but she’s loving the process of rearing another strong, brave, and kind-hearted helper. One thing is certain though: there’s no doubt that Cori, like her superpower siblings, is already making the world a better place. By reminding each of us of how the power to love and do good will always endure, Cori is an extraordinary superpower dog on the rise.